A high-level Parliamentary delegation from the Republic of Indonesia led by H.E. Mr. Fadli Zon, Vice Chairman of the House of Representatives, called upon the Election Commission of India today. The delegation included two Members of Parliament, as well as senior officials from Parliament and Ministry of Foreign Affairs. The Ambassador of Indonesia, H.E. Mr. Rizali Wilmar Indrakesuma and senior Embassy officials accompanied the delegation. 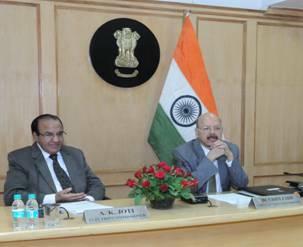 The delegation met the Chief Election Commissioner, Dr. Nasim Zaidi and Election Commissioner, Mr. A. K. Joti. Election Commissioner, Mr. Joti, in his welcome remarks, talked about the close relations between India and Indonesia, and briefed the visiting delegation about the innovations and initiatives introduced by the Election Commission of India in managing the Indian Elections. He stated that the Commission, as part of its sustained pursuit of excellence, had gradually introduced technological innovations, including the use of Electronic Voting Machines. These machines had been successfully used during the last three general elections and their reliability, authenticity and stability had been proven beyond doubt. Chief Election Commissioner of India, Dr. Nasim Zaidi, in his welcome address, referred to the age-old and strong relationship between India and Indonesia, particularly in the political, cultural and commercial fields. He also spoke about the close cooperation between the Election Commissions of India and Indonesia, particularly in the framework of the Memorandum of Understanding signed in 2011 and their collaboration in the Association of Asian Election Authorities, currently chaired by India. He expressed ECI’s desire for further strengthening of the cooperation with the General Election Commission of Indonesia through further exchange of experiences and skills. A power-point presentation was made to the Indonesian Delegation about the structure, role and work of ECI in managing the largest election exercise in the world. This was followed by screening of a short film on conduct of the General Election of 2014. The visiting delegates were also given a hands-on demonstration of the Electronic Voting Machine and Voter Verifiable Paper Audit Trail equipment. The delegates evinced particular interest in the Electronic Voting Machine and were impressed by the use of voting and counting technology used by ECI. The total sown area as on 12th June, as per reports received from States, stands at 75.10 lakh hectare as compared to 82.87 lakh hectare at this time last year. It is reported that rice has been sown/transplanted in 4.71 lakh ha, sugarcane in 41.58 lakh hectare and cotton in lakh ha. The Union Minister of State for Culture (Independent Charge), Tourism (Independent Charge), & Civil Aviation, Dr. Mahesh Sharma has assured that the Centre will take all possible steps to expedite the proposal of World Heritage site status for Majuli island located in the Brahmaputra river in Assam. Dr Mahesh Sharma held a meeting withthe Union Minister for Water Resources, River Development and Ganga Rejuvenation,Sushri Uma Bharti and Union Minister of State (Independent Charge) for Youth Affairs and Sports , Shri SarbanandaSonowalin this regard in New Delhi today. Dr Mahesh Sharma said that the Ministry of Culture is already working closely with the state of Assam to assist them in finalising the proposal. The state government will be assisted to overcome all roadblocks, he assured. Secretary Tourism, DrLalitPanwar and senior officers of the Culture Ministry were present at the meeting. The Union Minister of State for Culture (Independent Charge), Tourism (Independent Charge), & Civil Aviation, Dr. Mahesh Sharma met the Minister of State for Tourism & Culture(Independent Charge) , Government of Odisha , Sh. Ashok Chandra Panda in New Delhi today.Placing the pending issues before Dr Mahesh Sharma, Mr Ashok Panda requested him to expedite the reimbursement of funds for which the Utilisation Certificates have already been submitted. He further requested for branding of Nabakalebar as an International Festival and sanctioning funds for the proposed Light and Sound shows. Dr Mahesh Sharma assured Mr Panda that the Tourism Ministry will make all efforts to provide funds at the earliest for the three Light and Sound shows proposed to be held at Dhauli, Udayagire /khandagire Caves and at Konark. Dr Sharma assured that a special media campaign will be mounted to popularize Nabakalebar as an international festival. The campaign will be released in the electronic, print and cyber media, he added. The Odisha Tourism Minister urged Dr Mahesh Sharma to start an international flight from Bhubaneshwar International Airport to help promote tourism in the state. Dr Sharma said that he is very much seized of the matter and assured an early response in this regard. Secretary , Tourism, Dr Lalit Panwar and senior officers of the Ministry of Tourism attended the meeting.